St. Helena Optometry offers comprehensive eye care services and in-demand lenses and frames to St. Helena and the surrounding communities. Click or call to connect, and access the quality of vision care you deserve. 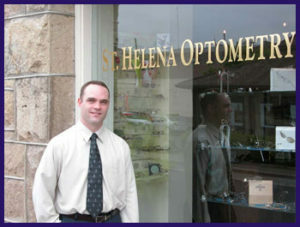 St. Helena Optometry offers quality St. Helena, CA, eye care for you and your family. We use up-to-date technology in an effort to help you achieve optimal eye health and vision. Our full-service optometry center offers comprehensive services, from routine eye examinations and screenings to detection and treatment of eye diseases and other conditions. Our friendly, professional staff will make you feel at home. Whether your current needs involve a vision correction procedure or treatment for a vision problem, eye condition, or disease, we hope to earn your trust through our dedicated St. Helena, CA, eye care services. Call St. Helena Optometry today to schedule an appointment and to inquire about our latest promotions.